With the UV index hovering at a high of 11 to 13 daily, I need to shore up my sunscreen arsenal. Besides faithfully applying my sunscreen, using a brolly and wearing my sunnies when I’m out, I’ve also been eating lots of SPF. Yes, you read that right—SPF can be eaten and that’s according to a new industry term coined as: Continual Dietary-Sun Protection Factor (CD-SPF). Apparently, scientists have placed an SPF value on diets. For example, consuming a kilo of black seedless grapes plus a portion of kale daily would give you an SPF 10. However, I have not been able to establish the CD-SPF levels of other food combination. Also, I don’t suppose many people like eating a kilo of grapes. The thing with a CD-SPF is, it is very much dependent on a consistent diet of foods that can help build up a natural barrier in the skin to the sunâ€™s harmful rays—pigment-rich fruits and veggies such as blueberries, blackberries, raspberries, figs oranges, blackcurrants, black grapes, dark green peppers, kale and spinach, amongst others. These foods are high in ellagic acid, anthocyanins, phytochemicals and vitamin C, all which act as antioxidants to protect our skin from sun damage. The main destroying factors for skin are oxygenated molecules which are often call â€œfree radicals.â€ To stimulate the skin to repair and build itself naturally, we need an arsenal of potent ingredients. The â€œantioxidant powerâ€ of a food is an expression of its capability both to defend the human organism from the action of the free radicals and to prevent degenerative disorders deriving from persistent oxidative stress (source). But such a diet alone is not able to ward off those harmful UV rays. You still need to use a sunscreen daily. Nevertheless, a CD-SPF diet would obviously provide a degree of protection. The key is to eat them daily. So what have I been including in my CD-SPF diet of late? Berries of sorts! 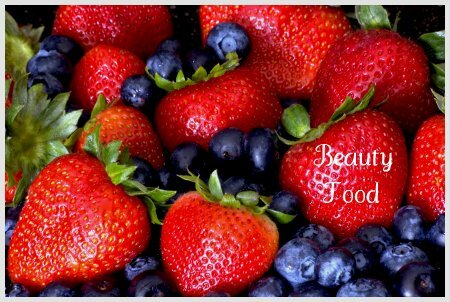 They are not just pretty to look, delicious to eat, they pack a punch of vitamins and antioxidants that are essential for protecting our skin from cell damage. 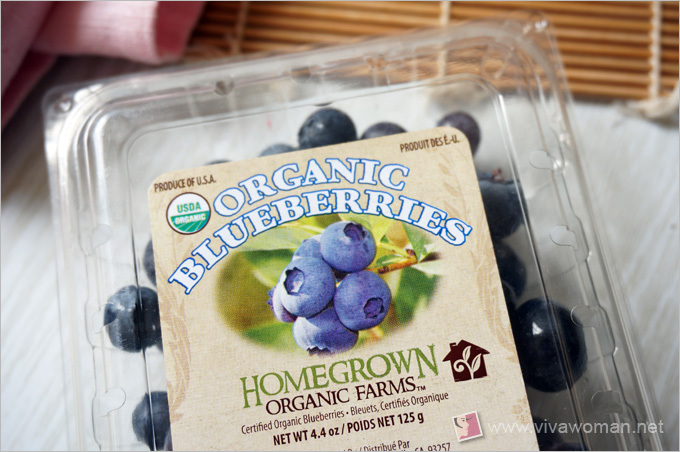 Blueberries, especially the wild variety is the best because it has high anthocyanins concentration. In fact, it’s antioxidant capacity is higher than many other types of berries. Did you also know that blueberries contain resveratrol? According to research, resveratrol protects epidermal skin cells that are exposed to UVA wavelengths from free radicals (source). Raspberries contain ellagic acid which blocks the production of enzymes caused by sun exposure that break down collagen in the skin, leading to wrinkles, skin roughness, and a reduction in skin elasticity. Raspberries are also rich in vitamin C, which helps fight off DNA damage to skin cells. Researchers have found that people who consume raspberries have less wrinkles, softer skin, and firmer skin than people who donâ€™t consume raspberries. Â In fact, the very pigments that make raspberries red protect those berries from oxidative damage (source). Going by the color alone, you can tell that blackberries have very strong antioxidant properties and included in the properties are the anthocyanins thatÂ help keep our skin young-looking by neutralizing wrinkle-causing free radicals. In addition, blackberries are a wonderful source of vitamin C and we know that vitamin C helps our body form collagen and elastin, two structural proteins that give our skin support and elasticity (source). In addition to being chock full of vitamins, especially vitamin C, strawberries also containÂ anthocyanins, the vegetable pigments that afford them their red colour. Some studies have suggested that a topical application of strawberry extracts can help protect skin against UV damage but ingesting themÂ definitelyÂ contributes to protecting our skin against ultraviolet radiation (source). So I mentioned that blueberries are a great source of antixodiants, outdoing many other berries. Well, it turns out that acai berries are even better! The dark purple pigments in acai berries contain anthocyanidins–twice thatÂ of blueberries–in addition to resveratrol and ellagic acid. The color of acai (pronounced ah-sigh-ee) is derived through very unique double bond structures that provide intense antioxidant protection from the detrimental effects of long-term UV light exposure for these fruits and vegetables (source). So yes, consuming acai berries daily is definitely great to protect your skin from UV damage and environmental free radicals. Not forgetting that acai is a good source of vitamin C and E, which are known to protect and fortify skin against the sun. But the thing is, we don’t get fresh acai berries here. So what’s a girl gonna do if she wants some? Supplements! I’ve tried powdered acai but when I spotted this Natrol AcaiBerry Ultimate Super Fruit supplement at iHerb, I had to do a Â double take. What? 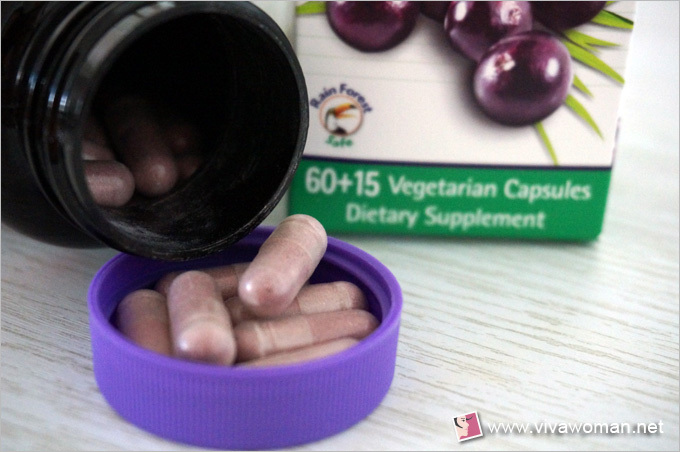 All 75 veggie caps of this Acai Berry supplement cost just US$7.50? With a 4.5 out of 5 rating by 315 reviewers? I can’t believe it! Of course I had to order. Well, I wasn’t disappointed and not long after, I even ordered the second bottle. And very soon, I will be adding my third bottle into the shopping cart. I think this is the cheapest supplement I’ve gotten by far and the best part, all I need to take is two capsules a day! Depending on where you are located, fresh super berries are really not cheap. Over in Singapore, raspberries and blackberries are pretty expensive. So are blueberries. The organic versions cost even more. So unless you have really deep pockets, eating a combination of these daily may not be viable. I suppose you can eat a few of each but they may not amount to much to give you the required internal SPF. Also, consuming the juice of these berries won’t give you as much benefits as consuming them whole and fresh. What I would recommend is to eat them a few times a week instead. Maybe blueberries one day and strawberries another. Say set aside about S$10 to S$12 a week? But add a supplement like acai berries daily and you’re good. Anyway, all these berries provide other forms of benefits other than their sun protection properties I’ve discussed so they’re really good for general health. 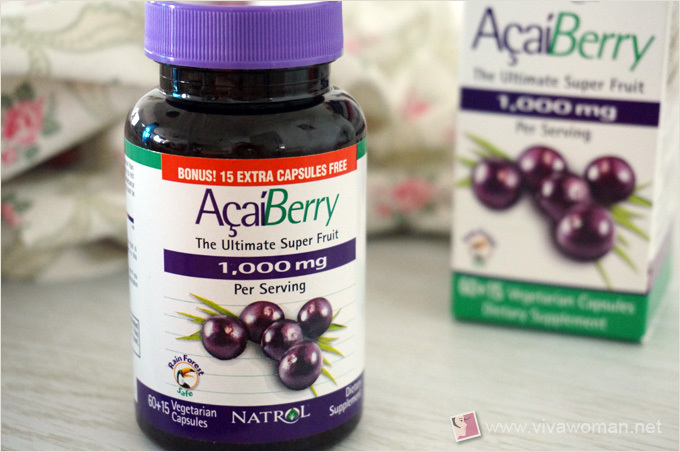 Like I mentioned, I purchased the Natrol AcaiBerry Ultimate Super Fruit supplement from iHerb. While I like this supplement, please use your own discretion to decide if this is suitable for you, especially if you have health concerns. I am responsible for my own body but I cannot be responsible for yours k? But if you choose to get it and youâ€™re shopping at iHerb for the very first time, you can enjoy US$10 off if your purchases are $40 and above (US$5 if below $40). Use my promo code OVO966 (affiliate) or just click through this ink. If you’re from Singapore, you can enjoy free shipping if your purchases are above US$40 for items weighing up to 14 pounds. Shipping is about five days and you’ll be given a tracking number if you ever need to locate your parcel. 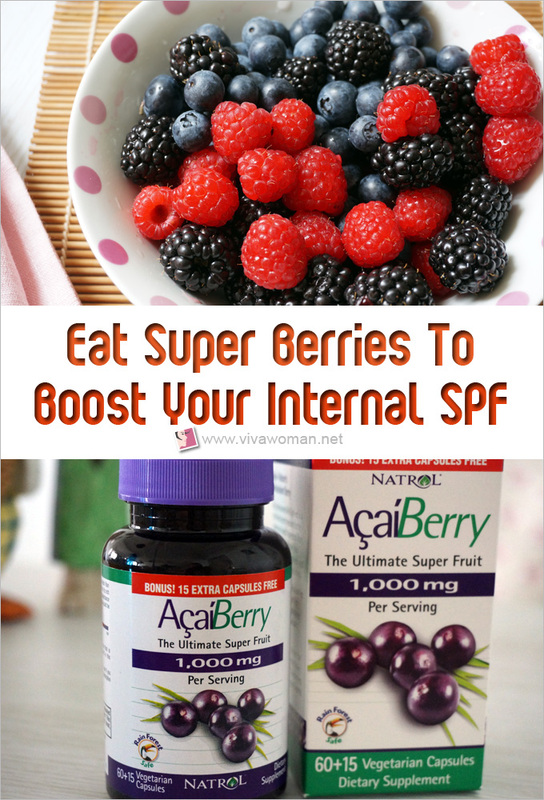 Oh, by the way, eating berries isn’t the only way to boost your internal sun protection. You can also eat more tomatoes, watermelon or drink green tea. 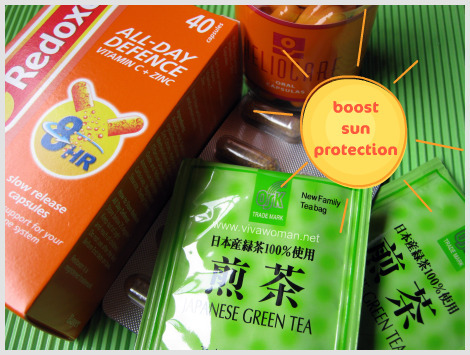 For a better idea of how these foods can constitute an SPF diet, check out my old entry here. But do share with me if you enjoy eating berries. I used to love eating blueberries and strawberries but now, my favorite is blackberries. I was initially put off by the sight but once I’ve tasted it, I cannot get enough! It’s so good I’m already salivating while writing about it! Yes, I have heard of boosting SPF by eating antioxidants. Great recommendations. I usually just drink green tea for this but now I’ll have to try adding berries in the morning. Great blog post as always. Good for you that you’re drinking green tea! 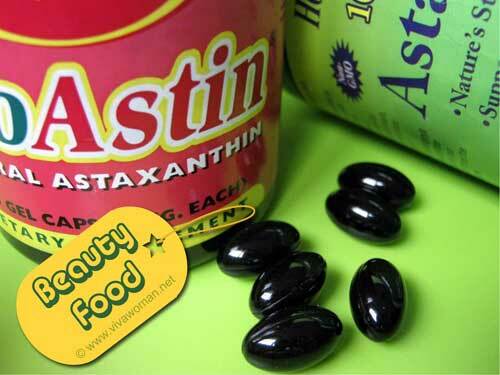 It’s a great antioxidant too. I enjoy blackberries, blueberries, strawberries and sometimes blueberries. I’ll be adding more blueberries to my diet and order the berry supplement. As I am aging, it’ll be good to include more berries to my diet to fight exposure to the sun. I live in New Orleans where we worship the sun and are tan bronze goddesses. Hail to the bronze goddess! 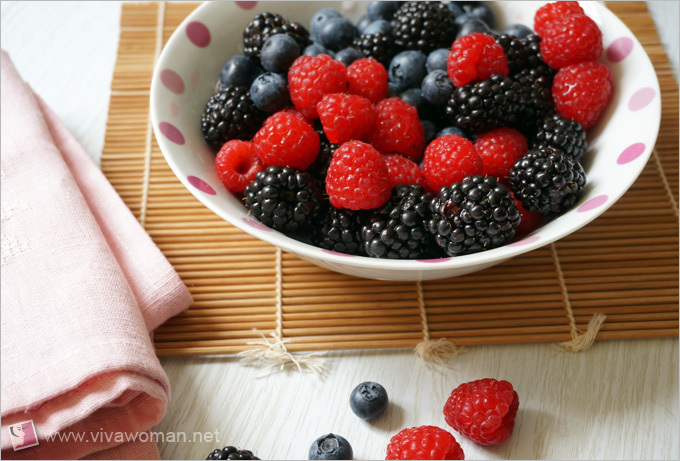 BERRIES ARE A GOOD SUPPLEMENT FOR SPF, BETTER TO USE NATURAL BERRIES! I always try to eat raspberries and blackberries in my breakfast.